Keep your gym healthy and your gym members happy by regularly using Wipex Gym & Fitness Equipment Wipes with Vinegar and Lavender Essential Oil. You can feel confident that your valuable gym equipment is clean and protected from daily sweat and dirt, and that your gym members are enjoying their workout without someone elseÕs grime. This will keep your members coming back and maintain your excellent reputation for being a professional, hygienic, and safe space to work out. Wipex alcohol-free gym wipe are safe to use on hands and equipment, (including your LCD screens) and won't smear, streak, or dry your equipment or shred during use. 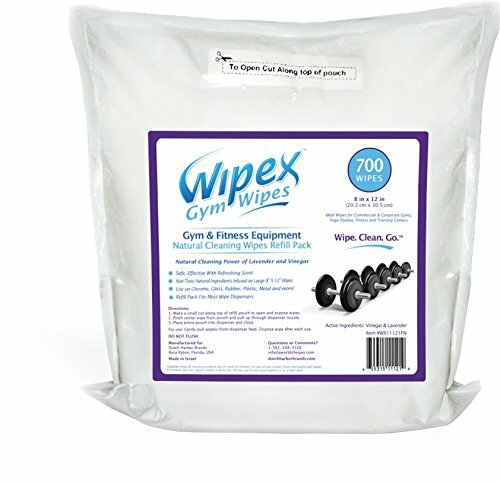 To ensure responsible earth-friendly cleaning, Wipex Natural Fitness Equipment Wipes are infused with natural ingredients, including white vinegar and lavender essential oil. DonÕt forget, you are always eligible for 1 FREE Wipex Fitness Wipes Dispenser with a single purchase of 12 rolls of Wipex Natural Fitness Wipes Refill. If you have any questions about this product by Wipex, contact us by completing and submitting the form below. If you are looking for a specif part number, please include it with your message.